It's been awhile since I've been to the movie... was thinking of watching Hitch or Robots, but have to find kaki to watch. hehe.. Anyways, talking 'bout movies, I remember those good 'ol days when I worked in TGV One Utama. I'll post some interesting stories next time. I reckon One Utama TGV has one of the best cinema seats due to it's sloping-stlyed seating (they call it 'Stadium-Seating'). Anyways, since I used to work in TGV for 2 1/2 years, I thought it's appropriate to post a guide on selecting Cinema Seats. Row Q: Back row seats. 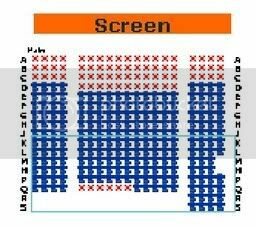 Normally not sold, reserved for emergency (double sitting, VIP guests, last minute entry or people who sneaks into cinema). Row L-P: Good seats, You will get excellent surround sound experience (from THX speakers and from all the kids around you), nice view of the screen and excellent leg space. Row H-K: Excellent seats. IMHO, the best seats in DA HOUSE! Screen is just at your eye-level and sound experience is optimal but for some reason, leg space here is abit limited. Row F-G: Ok seats. To me, these seats are still ok.. not as bad as what everyone says. However, if you do get these seats, make sure you get the aisle seats. Centre seats will make you strain your neck and you'll be counting stars when you come out from your movie. Row C-E: Near front seats. Damn, sit at the sides... seriously, it helps. Thanks. I'll keep this information in mind when I'm going for movies. H-K would be the best. Y dont they just trim the whole A-B-C away? I pity anyone who would queue up for ticket for sprained neck later. For smaller cineplex, the first row is actually blocked in the system. Thus, the first row can't be sold.